Writing is one of those activities that can be relaxing and enjoyable, or frustrating and anxiety producing, on any given day. It frequently depends on the nature of what you're writing, if you're on deadline, who or what your writing is for, etc. Like most things in life, the mindset you are in when you are writing has a lot to do with the outcome and final product. It's a lot like if you're nervous about preparing a dinner for 10 guests -- you're more likely to burn the roast or overcook the potatoes because, HELLO, you were nervous. On the otherhand, if it was just your or a close friend, or a forgiving spouse, you could just throw together a grilled cheese sandwhich in five minutes and that would be the end of it. I know I have better results and an more relaxed when I am writing about an idea came up with, or for a project that I created. But everyone knows that in business, this is often not the case. If you are in marketing or communications, you most likely need to write up a report, or maybe a white paper or a speech. You might be writing an article for your executive director or board member, or a memo, or even a strategic pitch letter to a potential stakeholder or client. Social media is a whole other story. There are blog posts, which can be tricky if you are ghostwriting for someone else, or in the voice of the company. Social media updates might be a piece of cake for your own profiles, but now you have to become the persona of your company or organization. So, here are a few tips to help out if you are feeling stressed, but need to "produce," whether it be personal or business writing. It has be tough to find quiet in a busy office with people all around you, particularly if you are in an open area and don't have your own office where you can shut the door. Try using headphones so you can tune out any noises or distractions, and tune into quiet music, such as a CD, or an online station like Pandora. If you have more quiet at home, try creating a rough draft or outline there, so when you get into work you already have a foundation to build from. If your office is quieter earlier in the morning or later in the day when most people have gone home, plan on coming in early or staying late so you have the quiet you need. If it's too noisy for you at home, try the Carrie Bradshaw method of working in a coffee shop, or head off the the library or a nearby park. Find places you like to go to read -- they tend to make good places to write as well. I like to have relaxing and inspiring images around me when I write. 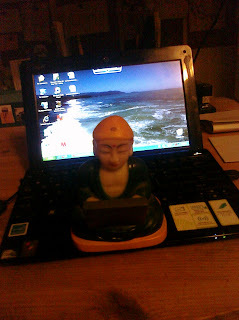 So, I typically set up ocean scenes on my computer desktop (it's corny but it works), and when I'm working at home I like to have my friend Buddha, who you see in the photo, handing around. He's just a plastic souvenir I picked up once, but I find him effective! Most writing stress stems from last-minute or urgent deadlines. To the extent that you can, plan your writing as much as possible so you have time for the various phases that writing requires: first draft, second draft, final tweaks, final. If you are on an unavoidable tight deadline, do the best you can and don't try to be perfect. Sometimes overthinking your writing can be worse then going with your instincts. You shouldn't try to be perfect, but you should try to be really good. Whether it's yoga (my exercise of choice) or a walk around the block, do something to get a change of scene and get some air. If you're between drafts, that's the perfect time to take a break so you can approach your revision with a clear head. If you have a complex project like an annual report or a long article, break it down into doable sections. Start with an outline if you like working that way, and write a page or two a day, as time permits. Some fiction writers say they are able to write a complete book a year by just writing a page a day! Make sure and tell someone -- whether it's a colleague, or your spouse, or a friend, that you have a project and a deadline, and that you will keep them updated. Maybe not every minute, but at least have them check in with you at the end of the day, so they can keep you honest! It works both ways - when they have an urgent deadline you can in turn check in with them and make sure they are on the right track, especially if you are working on a team or collaborative project. Everyone procrastinates to some degree, and you should allow yourself to be human. If you must sharpen your pencil or get that cup of coffee before starting, go ahead and do it, but then really start. If you find yourself truly blocked, tell yourself you'll just give in ten minutes to start. Most of the time when we start working, we forget what time it is and keep going for much longer then we planned. Know that once you have finished your writing, or at least a significant milestone, there's a reward on the other side. Maybe it's a nice meal, or a day trip somewhere, or maybe just a full night's sleep, if you've been deprived! What writing tips do you have to share? How do you stay relaxed and focused when you are writing?